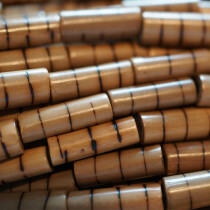 Unique handmade bamboo beads are extremely versatile and a must have for any bead enthusiast!. 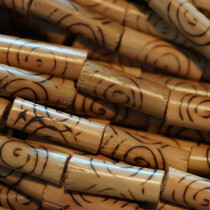 Keeping the bamboos natural tubular shape, these beads have a funky vintage look and are popular with Bohemian and Tribal style fashions. 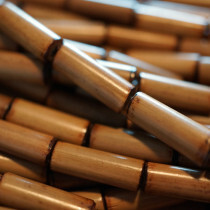 There are many ways to be creative with bamboo beads. From simple bamboo earrings to exquisite multi-strand necklaces. You can use these dress up bags and clutch purses, great for adding tassels to cushions and lampshades. 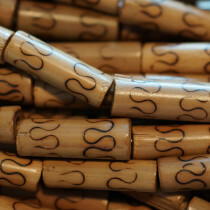 Bamboo Beads Burned Swirl Design 7x17mm (~42ce Strand) - 80cm/28" Strand. Hole size ~ 2-3 mm. Wax Finished.